Demonstrators display “Llibertat” yesterday EFE. 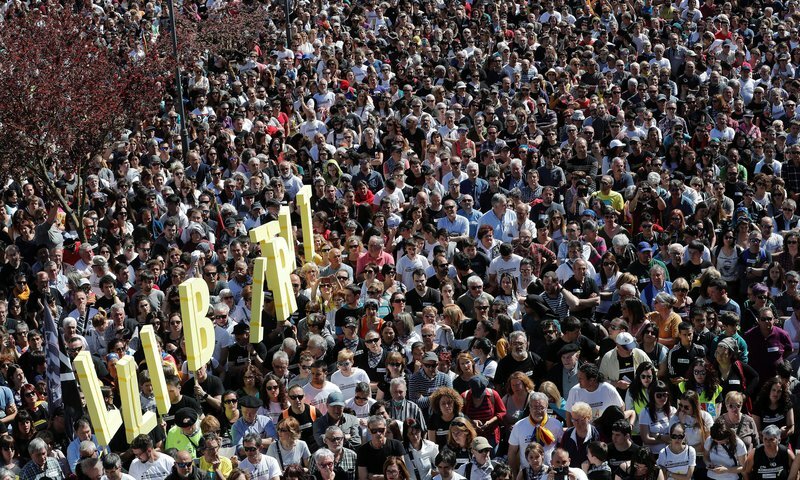 Under the slogan “this is not justice”, 60,000 demonstrators turned to the streets this Sunday to demonstrate in favour of the eight youths sentenced in the Altsasu trial two weeks ago. Seven of the eight have already spent 862 days in prison, for charges related to an alleged bar brawl with two off-duty Guardia Civil officers in 2016. The demonstration exceeded all expectations, and completely filled the small town of Altsasu, which has only 7,500 residents. From early morning, the entrance to the town was completely filled with cars, buses and caravans which had come from all over the region to demonstrate solidarity with the youths, whose charges of up to 13 years in prison were upheld on appeal, by the National Court, last week. Estelades and yellow ribbons were also seen at the manifestation, showing that people had travelled from as far as Catalonia to demonstrate.